This accent sofa will be the perfect centerpiece for your contemporary home. 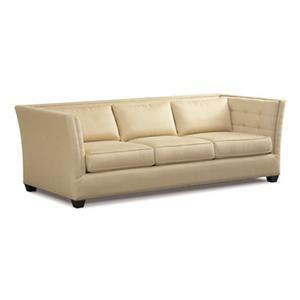 Designed with luxury in mind this piece features plush seating and intricate design details. 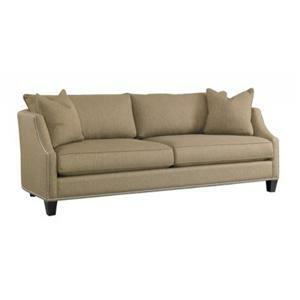 Inner arms feature button tufting and flared silhouette. Supported by tapered block legs, plush seats complete a comfortable seating option for your modern living space. Add this dining side chair to your home for a comfortable mealtime experience. Splayed legs, winged panels and a slightly reclined back complete a contemporary style. 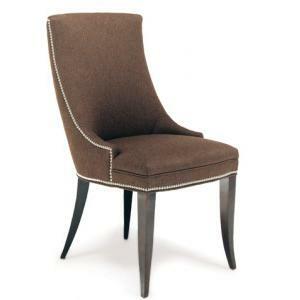 Adorning the silhouette is a polished nailhead trim to take this chair to the next level. 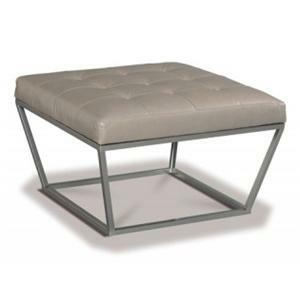 Contemporary in style this modern cocktail ottoman will make for a perfect accent to your existing decor. The plush seat features deep button tufting within the leather upholstery. A simple metal base has a chrome colored finish to complete the simplistic design. 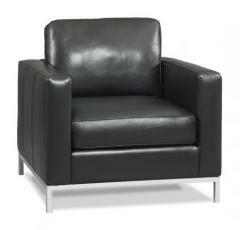 Luxuriously modern this chair features a stunning leather upholstery that is highlighted by chrome finished legs. Thick track arms are padded for comfort along with medium plush seat and back cushions for support. 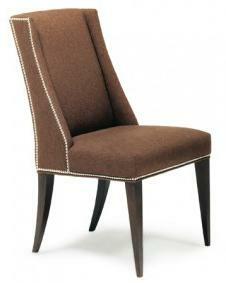 Perfect for you home office or living space this chair has an elegant, contemporary style. Use this chair in your living room, master suite, or almost anywhere in your home for a stylish accent. The low wing back is adorned with button tufting while the frame is outlined in beautiful nailhead trim. Supported by tapered legs this chair has a unique silhouette. A padded seat provides comfort and support while adding to the modern design. 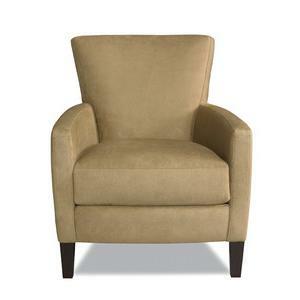 Simple and casual this upholstered chair is the perfect seating option for any home. Relax in complete comfort with a plush attached back and square seat cushion. Framed by rounded track arms this chair has a simple silhouette that is completed by tapered legs. Comfortable and cozy this transitional sofa combines traditional detail with modern design. Tapered block legs and plush cushions represent the modern simplistic view of design, while polished nailhead accents and sloping track arms bring in the traditional. Add this sofa to your home for a stylish and relaxed seating option. Impeccable modern styling with glamorous retro flair evokes an Old Hollywood feel. 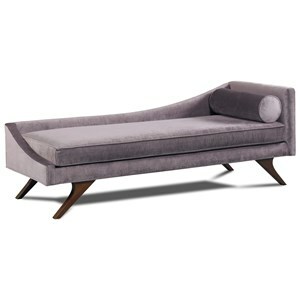 This chaise dazzles with an exaggerated sense of movement in the splayed wood legs and the sinuous curve of the back. Make your room feel a dash more like a starlet's boudoir with this smashing piece. 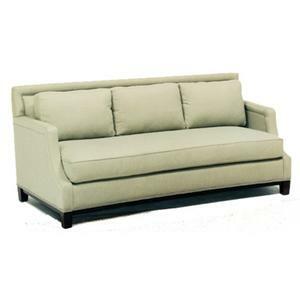 Moderately scaled, this sleek sofa is perfect for smaller spaces where comfortable seating is needed. Three plush back cushions are loose so you can adjust them to give support where you need it. Simple track arm have a sloping design for an eye appealing look. Add this dining side chair to your home for a comfortable mealtime experience. Splayed legs and a rounded back complete a contemporary style. 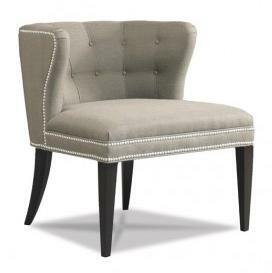 Adorning the silhouette is a polished nailhead trim to take this chair to the next level. A fine piece of Precedent Contemporary Upholstery reaffirms what you've always known about American furniture making—nobody does it better. For the past 30 years, the skilled artisans at our plant in Hickory, North Carolina have been faithfully crafting superior furniture. That's 30 years of checking and rechecking every joint and seam of every frame and fabric. It's a proud tradition, upheld by a generation of dedicated workers who know by experience, there's simply no other way to produce a truly fine piece of furniture.